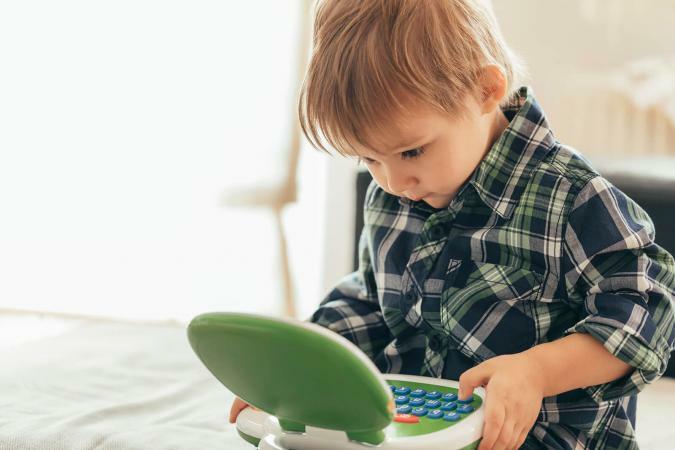 Although an educational toy laptop will not necessarily make your kids smarter, it will help with developmental and academic milestones while providing entertainment. The best choice of laptop for your child will be determined by his or her age and will offer a wide range of educational, interactive and fun activities. Laugh & Learn Smart Stages Laptop by Fisher Price includes Smart Stages technology which allows the learning content to change as your baby grows. This interactive laptop offers 3 levels of play and is appropriate for little ones that are 6 to 36 months of age. Your child will learn numbers, letters, colors, sounds, phrases, songs and much more. This laptop can be found at Buy Buy Baby and sells for about $20.00. 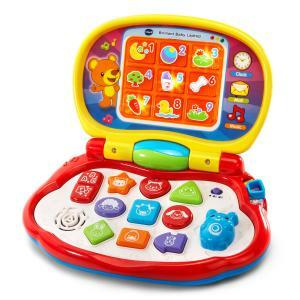 Brilliant Baby Laptop by VTech is designed for babies 6 months and older and will help your little one explore and learn. It has 9 colorful shape buttons, a movable mouse and a light-up screen. It has animals, shapes and music modes to explore and learn. Amazon carries this laptop and is priced at about $20.00. Laugh and Learn Click and Learn Laptop by Fisher-Price has plenty of hands-on activities to keep babies busy. There are 123 and ABC buttons, shape and color flippers and music and emoji sliders. There are colorful lights and over 40 songs, sounds and phrases that teach your child about colors, shapes and more. This toy laptop is for babies 6 months and older and can be found at Kohls. It costs about $15.00. 2-in-1 LeapTop Touch by LeapFrog converts from a laptop to a tablet mode. There are 5 learning modes that include letters, numbers, games, music, and messages. 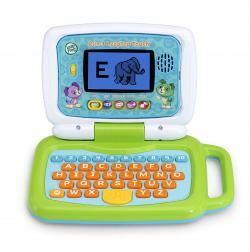 This LeapTop comes in green or pink and is for ages 3 and up. It can be found on Amazon for about $20.00. Tote and Go Laptop by VTech offers 20 interactive activities. It teaches many subjects at progressive learning levels. Your child can explore letters, words, shapes, numbers and basic math. There's also animal and food activities, puzzles and songs. A mouse is included with the laptop that will teach your child basic mouse skills and help with hand/eye coordination. This laptop is ideal for ages 3-6 years old and sells for about $18.00 at Walmart. Little Girl Kid Interactive Laptop by Winfun features fun games with simple concepts and is for ages 2 years and up. There are 6 activities that include numbers, letters, and shapes identification. It has a large LCD screen and a built-in handle. It sells for around $36.00 on Amazon. There is a bilingual version of this laptop. The Pro Light Kid's Bilingual Learning Laptop (English/Spanish) has 50 interactive educational activities including language, math, science, geography, music, games and translation cartridges. It has a large LCD screen, tethered mouse and an LED backlight. It is also on Amazon and is priced at about $37.00. Inspiron Chromebook 11 by Dell is an excellent option for a kid-friendly laptop. 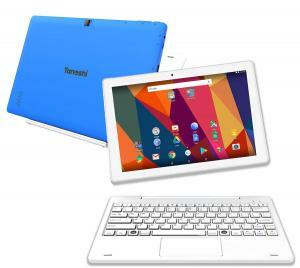 It is an 11-inch Chromebook laptop with worry-free technology. It is compact, has a textured exterior that resists fingerprints, is drop resistant and spill-resistant. It can be found on Dell.com and is priced at around $200. The 2-in-1 Computer for Kids by Tanoshi can be used as a laptop or a tablet. It is the ideal learning tool for kids age 6 and older. This is not a toy laptop but an actual real computer. There are pre-loaded educational apps and easy to set-up parental controls. It comes in blue or pink and costs about $170 on Amazon. The Hack Computer by Hack is a great everyday, high-performance 14-inch laptop. It was named 'best first laptop' by Parents Magazine. Hack is the only computer that teaches kids how to code by letting them hack apps, games and the operating system. There is no prior coding experience needed and is recommended for kids ages 8 and up. There are additional pre-installed apps that help your kids learn how to code, help with their homework, allow them to play games and safely surf the internet. This laptop can be found on Amazon for about $300.00. Kano Computer Kit - Make a Laptop is for kids who want to know more than just how to use a computer. If you have an engineer in-the-making who's over 8 years old, you may want to consider this laptop. Your child can build this fully functional, powerful laptop step-by-step. In the process, they will learn about coding, pixels, processors, HDMI and more. 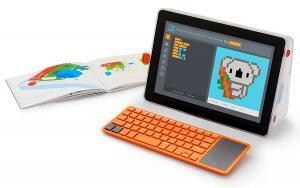 Kano also offers a build your own computer kit and a build your own tablet kit. The laptop version can be found on Amazon for around $180. The computer kit and computer touch (tablet) kit can be found at Target for about $98.00 and $280.00 respectively. The educational toy laptops are undoubtedly a great option for younger kids and will help them learn the basics of how a computer works. They are also entertaining, interactive and simply make learning fun. Once your child outgrows the toy versions of the laptop, it will make the transition to the 'real thing' a much easier process.